Davis Hospital and Medical Center (DHMC) opened in 1976 with four operating rooms, 100 beds, and 105 employees. Today, Davis Hospital and Medical Center has 126 licensed beds, 550 employees, more than 200 active medical staff, and 200 volunteers. Between 1983 and 1995, the hospital expanded tremendously in order to accommodate the growing needs of Davis County, one of Utah's most populous counties. During that time, the hospital added a 10-bed Skilled Nursing Unit, Women's Center, Neonatal Intensive Care Unit and a Cardiac Cath Lab. DHMC averages 21,000 emergency department visits per year; 2000 babies delivered; 3,867 surgeries performed, and more than 6,000 admissions to the hospital on an annual basis. The Emergency Department supports two cardiac beds, one trauma room, two cast rooms, and five exam rooms. 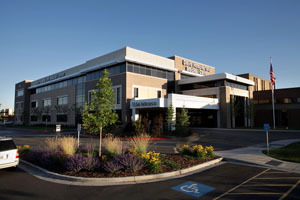 Davis Hospital is located at 1600 West Antelope Drive in Layton, with easy access from Highway I-15 from exit #335. To visit their website click here.